Aerial portions, can be used fresh or dried, except the roots. A ubiquitous, small, annual plant; its erect, simple or branching stem grows from 6-18 inches high above a rosette of basal, gray-green, pinnatifid leaves, often deeply toothed and somewhat hairy, dandelion-like. The root is small, white, and perishes every year. It bears a few small, sessile, dentate leaves along its length; the leaves on the flower stalks have clasping bases. The tiny white flowers grow in terminal, erect, cymes, each blossom has four white, spoon-shaped petals, in many places blooming all year. The fruit is a flattened, heart-shaped or triangular, notched pod, borne on long stalks. Flowers all summer. Taste is like cabbage; odor is unpleasant. Common in fields and waste places, backyards, fields, and along roadsides everywhere. A small but distinctive weed found throughout the United States and much of Canada. Introduced from Europe. Amino-alcohols: choline, acetylcholine, saponins, mustard oil, monoamines, amino-phenol and tyramine; also diosmin, a flavonoid, vitamins A, B, C.
Shepherd’s purse was given this common name because its seed pods resemble an old-fashioned leather purse. Nearly every wheat field is full of this herb. It grows over the entire United States. When chewed, the green grass has a very pleasant peppery taste. To collect the seed pods for a nutritious meal is unheard of today, but the body-building elements which our fathers of America knew by test and experience still remain. They roasted the seeds and combined with other meal for pinole bread. From one plant 64,000 seeds are shed periodically in one season and can thrive on any soil. The leaves were used raw, or as pot herbs like spinach. Eaten as food by many of the poor people of China. It is both wild and cultivated there. 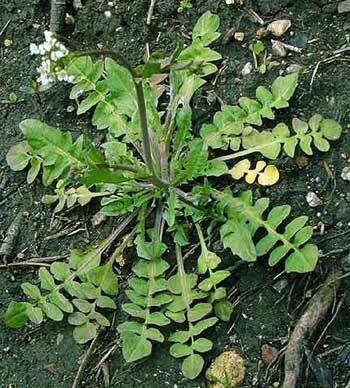 This plant is still considered by most people to be a weed. An extract of shepherd’s purse is an effective blood coagulant which can be used for internal or external bleeding, including nosebleeds, blood tonic, colon trouble, bed wetting, hemorrhoids, venereal disease, malaria, typhus, lung tuberculosis, bleeding ulcers, stomach troubles, helps relieve pain, bleeding from the lungs, piles, profuse menstruation, kidney complaints, fever, jaundice, and hemorrhage after childbirth. Used as a compress for cuts and wounds especially of the head. An infusion of the dried herb can also be used. It acts to constrict the blood vessels and thus to raise blood pressure, but it has been said to regularize blood pressure and heart action whether the pressure is high or low. It is effective too for various menstrual problems, including excessive and difficult menstruation. It is sometimes used to promote uterine contractions during childbirth and can promote bowel movements with a similar effect on the intestines. Tea is used for diarrhea, dysentery; and externally as a wash for bruises. It is used in genito-urinary problems, difficult urination, and post-partum bleeding (after child bearing) and to improve eyesight. It has mustard-flavored leaves and can be added to salads. For drying, best collected in summer when partly in fruit and dried quickly. Do not keep shepherd’s purse longer than a year. Infusion: steep 1 tsp. fresh or 2 tsp. dried herb in 1/2 cup water for 30 minutes. Take cold, 1 cup a day, not to exceed 2 cups per day, unsweetened, a mouthful at a time. Also a good remedy for diarrhea. Decoction: add 2 oz. of shepherd’s purse to 1-1/2 pints of water, slowly boil the mixture down to 1 pint. Strain and take cold, 1 cup 4 or 5 times a day until results are obtained. Cold extract: soak 3 tsp. fresh herb in 3/4 cup cold water for 8-10 hours. Take in the course of a day. Juice: take a tsp. of the juice several times a day. Tincture: take 20-40 drops, 2-3 times a day. Potassium and calcium, vitamins A, B, C.
Seeds are known to cause blistering of skin. Avoid the herb in pregnancy, except during labor, because it stimulates uterine contractions. If there is a sudden change in menstrual flow or blood in urine, seek professional advice before attempting self-medication. This herb raises blood pressure. Avoid if Hypertensive.